There is no better way to enjoy Southwest Florida's weather than dining and entertaining outdoors. 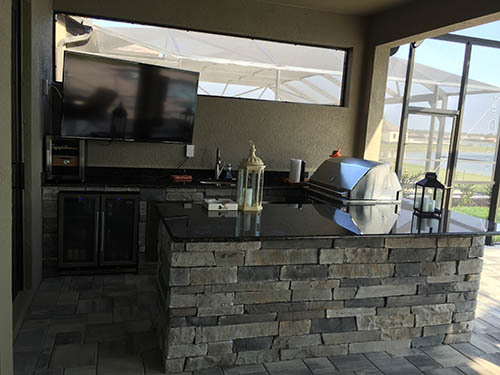 We custom build outdoor kitchen to fit your needs from layout to design. 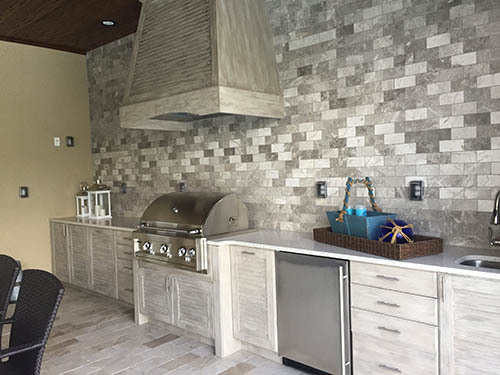 We provide the necessary materials including counter tops, grills, refrigeration, storage, and more. So, if you want to ensure that your home looks its best for the longest time possible, then you need to contact Residential Maintenance Solutions Inc (RMS) today. Don’t let the outdoor Florida lanai area be just a pool, make it an extra room to build many memories with little work and investment. You can transform into something altogether more fun and interesting. This is definitely the case when you invest in a great-quality lanai remodeling service from Residential Maintenance Solutions Inc (RMS). The reality is that renovating or remodeling your lanai area is a far more healthy choice and cost-effective option than just redecorating the inside of your home. At Residential Maintenance Solutions Inc (RMS) we are firm believers in the mantra that failing to prepare is merely preparing to fail. With that important lesson in mind, we will always follow the important four points very closely before starting any work. Residential Maintenance Solutions Inc (RMS), will allow flexibility to select or provide the choice of appliance to accommodate your need. Following the first step, we will walk along to make selection on materials including tops. After all design is approved , you will have your cook out within two weeks from the starting construction date.